A pot experiment was designed to evaluate the interactive effects of multifunctional microbial inoculation treatments and rock phosphate (RP) application on N and P uptake by alfalfa through the use of 15N and 32P isotopic dilution approaches. The microbial inocula consisted of a wild type (WT) Rhizobium meliloti strain, the arbuscular mycorrhizal (AM) fungus Glomus mosseae (Nicol. and Gerd.) Gerd. and Trappe, and a phosphate solubilizing rhizobacterium (Enterobacter sp.). Inoculated microorganisms were established in the root tissues and/or in the rhizosphere soil of alfalfa plants (Medicago sativa L.). 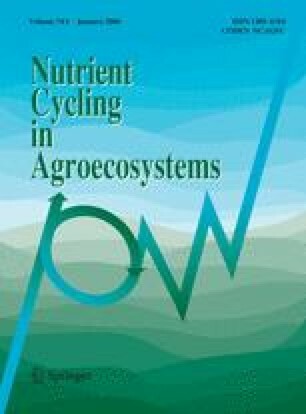 Improvements in N and P accumulation in alfalfa corroborate beneficial effects of Rhizobium and AM interactions. Inoculation with selected rhizobacteria improved the AM effect on N or P accumulation in both the RP-added soil and in the non RP-amended controls. Measurements of the 15N/14N ratio in plant shoots indicate an enhancement of the N2 fixation rates in Rhizobium-inoculated AM-plants, over that achieved by Rhizobium in non-mycorrhizal plants. Whether or not RP was added, AM-inoculated plants showed a lower specific activity (32P/31P) than did their comparable non-mycorrhizal controls, suggesting that the plant was using otherwise unavailable P sources. The phosphate-solubilizing, AM-associated, microbiota could in fact release phosphate ions, either from the added RP or from the indigenous ``less-available'' soil phosphate. A low Ca concentrations in the test soil may have benefited P solubilization. Under field conditions, the inoculation with AM fungi significantly increased plant biomass and N and P accumulation in plant tissues. Phosphate-solubilizing rhizobacteria improved mycorrhizal responses in soil dually receiving RP and organic matter amendments. Organic matter addition favoured RP solubilization. This, together with a tailored microbial inoculation, increased the agronomic efficiency of RP in the test soil that was Ca deficient at neutral pH.